Fragrant homemade bread has always been, and will always be decoration for each table. 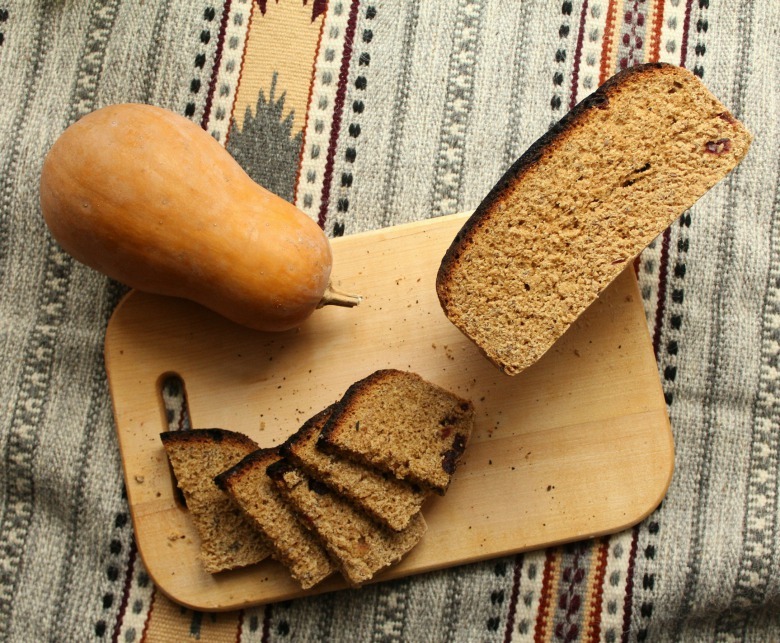 Today I offer to cook bread with pumpkin puree. Fragrant, crispy on top and soft inside, it is more like a cake. Taste with honey, morning coffee, jam and anything of your taste preferences you can flavor this bread, adding flax or dried fruits. On photo is just bread with whole wheat flour with the addition of flax and dried cranberries. 1. Stir yeast, pinch of sugar, 1 tbsp of flour with warm milk, cover with towel and leave for 30 min, for batter to rise. Amount of milk depends on puree;: if thick, then add more, if liquid- less. Or then simply regulate dough using flour, during batch. 2. In 30 min add sifted flour and rest of ingredients. At first add 600 g, then add depending on consistency: you should get elastic, a bit sticky dough. The main thing is not to overdo it — the dough should be soft and gentle. 3. Let the dough rise in bowl for 1-1,5 h.
4. After, form loaf or shift in prepared form and let it rise for another 30 min. Top of recipe "Pumpkin bread"